Futon is one of the oldest sleeping cushions of mankind. For about 2000 years, some sources speak of 2500 years, Futon is prepared in Japan as a bed place. Cotton in raw, slightly combed form is formed into a fleece (in ancient Japan by pressing and pulling, by hand) and pulled into a fabric cover, stitched against slippage or other deformation with a few pinholes. Such a Futon mat (Shiki) is only approx. 5cm thick and lies on the floor laid with Tatami mats (Old Japanese floor covering). Another futon mat (cake), which is a little thinner, is laid over it as a bedspread. The sleeper lies in between for sleeping, like a sandwich covering. This way of sleeping is hardly conceivable for our understanding of a bed or sleep and not a pleasant thing for our body structure. We Central Europeans are taller, heavier and much more likely to lie on our sides to sleep, which is partly due to the different shape of the spine; the Western body has the stronger lordoses. Partly it is also because the roots of our sleeping places were less fine than the Japanese Futons and one lies on a heap of straw better in stable lateral position. 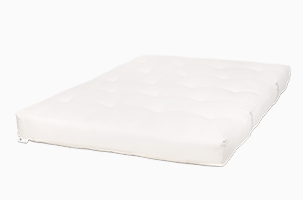 Very similar to today's miserable foam mattresses, which are also often made in thicknesses of 20 cm to 25 cm to compensate for poor quality with mass, which of course does not work. A good mattress / natural mattress for people of medium weight is 14 cm to 18 cm thick Japanese futons, as you can sometimes read in advertising or description of dubious or incompetent dealers, there is no such thing here, they would simply be too expensive, apart from the already dubious benefit. The futon or futon (Duden says masculine, but originally futon has no gender) of the modern era, the local futon, the Euro futon has little resemblance to the historical model. Actually only in the fact that several layers natural material (unfortunately also not always) are held only by staple points and not glued as with industrial mattresses. In closer terms, this production concept has also been the norm in Europe for centuries, but not in the usual and mostly cheap everyday goods. 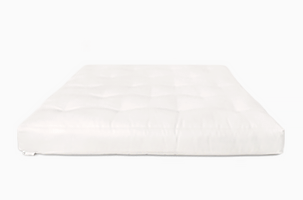 High-quality mattresses from companies such as Schramm, Treca, Vispring, Hästens, etc. have been handcrafted for many generations and hand-stitched by upholsterers. But back to the futon. 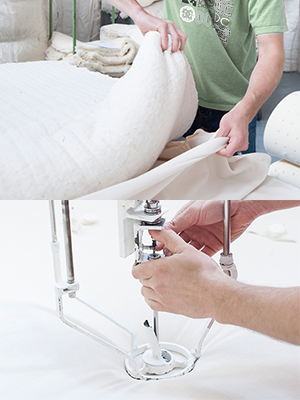 High-quality, modern futons, such as those from Futonwerk are also handmade. Raw materials such as New Wool, horsehair, coconut fibre, hemp or natural latex are processed in addition to cotton, which is less important in the local futon. The cotton, which is often presented as the main content of the futon, is actually too fine, too filigree for this purpose and it is defenceless against bacteria and moulds , which like to settle in the moist atmosphere of a mattress. In the old Japan it was different, there the light Futons were rolled up and put away daily, so that the cotton was loosened up and dried. But in this country almost nobody does that and the cotton is soon torn and hard. A little cotton in the futon is good because of its antistatic properties and in combination with other fibres and latex it remains supple. For this purpose, the prepared natural materials are laid on top of each other in fleece layers, fed into the upholstery fabric and finally joined to form a whole at around 18 tacking points (13-23). This principle enables the materials to unfold their effect unhindered, i.e. 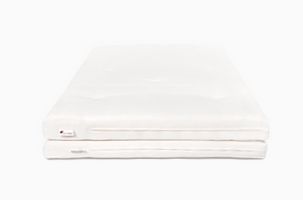 to have a soft, firm, elastic, air-conditioning, stabilising effect, everything a mattress should offer. The outstanding properties of the futon are its strength/stability on the one hand and its climate control on the other, which is so good that natural materials diffuse unhindered, i.e. allow moisture to pass through. A good futon is quickly warm to temperature, but never brooding, it is always balanced. But Futon stands for more than just good physical and technical functions. Futon is also an expression of an attitude to life. In the late 80s and early 90s, the rise of futon as a symbol of clarity and consciousness in the home began. At the latest since the beginning of modernity, the average person has also been dealing with the things with which he surrounds himself. The entry of this discussion into the bedroom, which had long been a taboo zone, took place only late, basically with the emergence of futons and the wild designs of futon beds, which looked so different from what one knew. Thus the futon and the futon bed were the openers of the bedroom, quasi a new cultural level, whose meaning is just as unclear to many people as the meaning of sleep for the human organism. Even today, 30 years later, Futon - in addition to the physical-technical aspects - still stands for 'being different', for openness, freedom, clarity, for mental and physical health. And in addition, the subject of futon has other aspects, such as ecological correctness in contrast to many synthetic mattresses. A really good Futon - like the products of Futonwerk- that consists exclusively of high-quality natural materials, is ecological and due to its long durability also highly sustainable. Sustainability is achieved when an ecological product lasts for a long time, i.e. only seldom needs to be replaced and accordingly few resources are consumed. As with all successful products, there are a lot of imitations, which then usually worsen the actual product. Unfortunately, this is also the case with futons and a large part of the futons offered are cheap imported products with dubious contents. A simple rule is that the one who knows what he is doing can also tell about it. 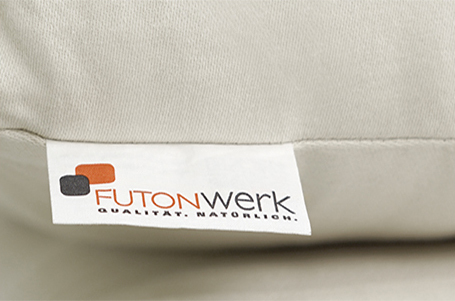 With quality suppliers such as Futonwerk you can see exactly which materials are used in which quantities, where the materials come from and whether they have been tested. Since there is no formula for it, which mattress serves which humans best and the vielbeschworene test couches also not really helps, because ten minutes on a new Futon/a new mattress say little about it, how this Futon/this mattress feels after three or even ten years and with your sleep makes, it is important that your dealer/supplier advises you fair and competently. Compare first the clarity and accuracy of the data of a offerer, if you want to find out, where you find quality. One thing's for sure: Who has found his right futon / his suitable natural mattress starts a new, better period of life.